Rhinoncomimus latipes weevils severely damaging mile-a-minute vines in Newtown, CT.
Mile-a-minute vine (Persicaria perfoliata; abbreviated MAM) is a highly invasive, non-native annual vine first recorded in Connecticut in 2000. The vine is capable of growing up to six inches per day (under ideal conditions). It out-competes and overgrows other vegetation, crowding out native species and interfering with seedling establishment in forest regeneration. 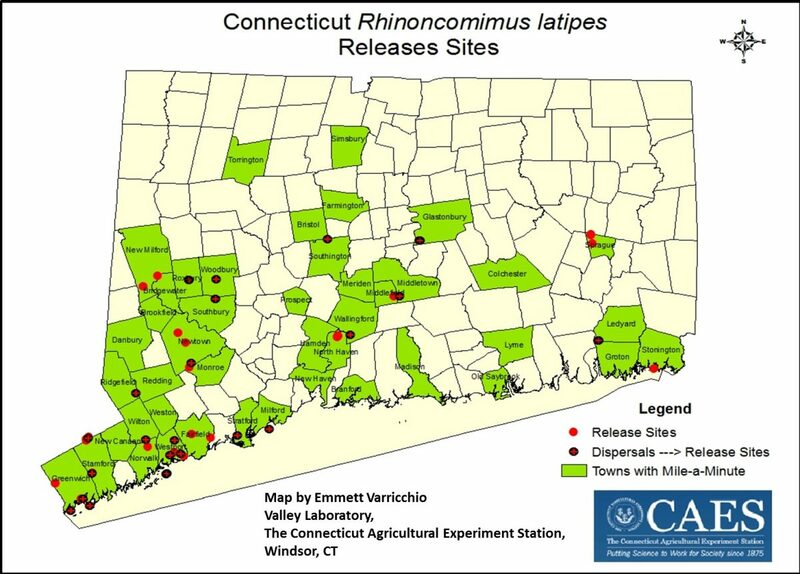 The Connecticut mile-a-minute biological control project began in 2009. Scientists from the University of Connecticut (Donna Ellis, Logan Senack) and The Connecticut Agricultural Experiment Station (Carole Cheah, Todd Mervosh) have introduced approximately 18,000 biological control agents in 10 Connecticut towns for control of this invasive vine. 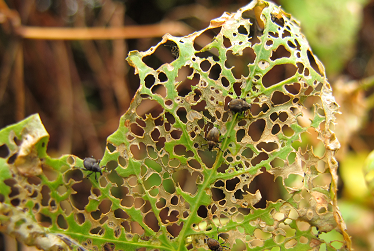 These biological control agents are beneficial weevils (Rhinoncomimus latipes) that are very host-specific and only feed on mile-a-minute. The weevils are establishing at each release site and over time will provide a sustainable solution to reduce mile-a-minute populations in the state. View a MAM Biological Control Poster by Carole Cheah (CAES) and Donna Ellis (UConn). For more information about CIPWG, visit www.cipwg.uconn.edu.